The most beautiful antique silver locket which is hallmarked for Birmingham 1898. The oval locket has been wonderfully embossed and chased with stylised patterns and bead edges. If you may be searching for something beautiful and unique, something beautiful to give to that special person this christmas then why not take a look inside our little antique jewellery store. We have mainly antique jewellery including Victorian and Edwardian period rings, brooches and pendants. We have just listed some nice interesting antique and vintage jewellery in out store. Please take a look round to see the beautiful unique items. A large chunky Cameo ring made in 9ct gold. The large oval cameo is well made and shows very little sign of wear. The band is quite thick at 8 mm wide. The ring is clearly hallmarked for makers W.E.V and dated for Birmingham 1939. It also has the gold quality stamped inside. An original Art Nouveau cameo glass vase by Emile Galle. The miniature baluster vase displays a superb acid cut single overlay design of red orange blackberries and leaves on a yellow ground. The vase displays the Galle signature which you can see on the images although the colour has faded over time. The piece is in excellent condition with no damage or restoration. A highly collectible item from one of the best artists of the Art Nouveau period. This is a gorgeous antique 9ct gold pendant. 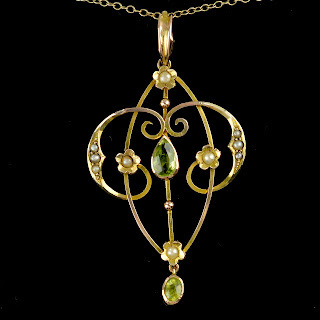 The gold frame has an ornate shape and is decorated with center teardrop peridot and hanging drop. There are also seed pearls set in gold flowers and some set into the gold frame. It has a nice bale and comes complete with gold chain. An attractive antique boat shape ring which displays emerald cut sapphires and smaller diamonds in between. The graduated sapphires have a gorgeous colour which displays translucent blue tones with the light. The stones are displayed in an ornate claw setting. Have a look at this lovely antique Edwardian period diamond ring.